This weekend was spent clearing some more rubbish from the allotment, and whilst on our travels we took a trip to the tip to get rid of some of the rubbish. Whilst I was at the metal skip, the Mr had been getting rid of some general waste and whilst there he spotted a box full of toys in the skip. Now its strict council rules that no rubbish is to be taken from the skips, however a creature so small and cute sat on the very top of a box. He knew instantly this was something worth recusing and reached for the miniature toy, it was when we got back into the car he placed a small figure in my hand. I knew instantly what it was, and it brought back so many childhood memories in an instance. I would always buy a Slush Puppie at the bowling alley, and at the seaside and it would always be a blue one. For me it’s always been such a gimmick buying a slush ice drink. As you can imagine this little fella has been by my side all weekend, I’m totally smitten and the fact I’ve been carrying him around in my pocket shows just how much I love him. How could you have not taken him from the skip! I'm glad you saved him from a death of the land fill, he deserves a new happy life. Is it bad that i've never had a slush puppy and i'm 25?! We used to buy them on the way to school - always had to be a blue one. Oh this is awesome! I remember having slushpuppies after I went swimming when I was a kid - so many good memories! Oh the memories, like Harriet above me I always had one after swimming - usually green! 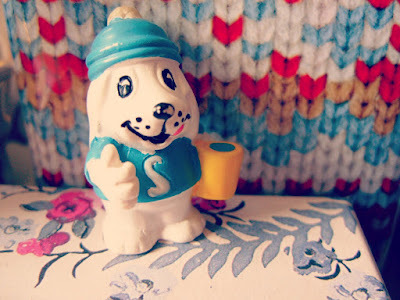 I'm with you on the blue slush puppies! Thank you for your lovely comments. Glad you liked the keyring.